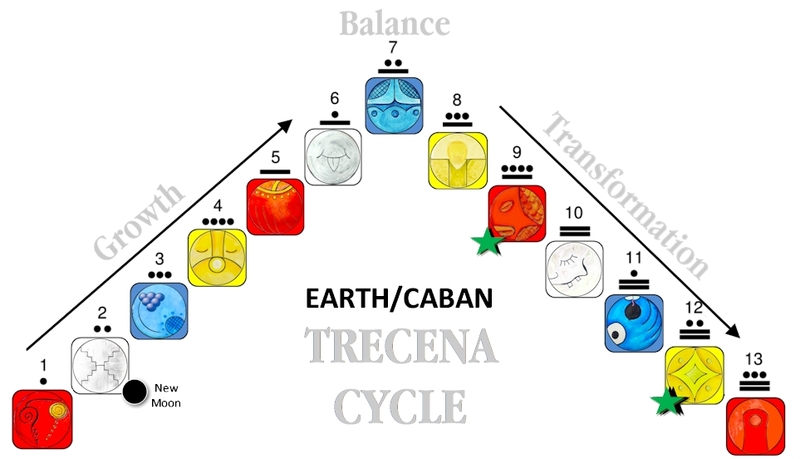 The Earth/CABAN trecena offers Mother Earth as the Divine Place where we could experience a new reality of our own creation. CABAN is guiding us to Know our Place in the Universe. Under the 8th uinal we began a transformation from Faith to Believing in Unconditional Love as our Power to Create our own Realities of Love. We were guided to see that our Love would Overflow through the Choice to Experience Unconditional Love. The 8th uinal offered the Divine Justice of Knowing that through the Creator’s Love we would always Receive More than our Hearts Can Hold. The number 9 emphatically intends the Completion of our Transformation, conveying the energy of Patience to see the Bigger Picture. The Spiritual Growth in progress is an Intention to see where Human fits in to the Bigger Picture. Number 9 is the “all that is part of the One,” expressed as zero “0” (the position of Sun/AHAU, the Omega). Today is Kin 162, which resolves to 9, in the 9th uinal, in the 9th month of September. Each repetition of the number magnifies its Intention. If we look into the future, on Tone 9 in this 9th uinal (another 999), we will receive the Spiritual Awakening of Serpent/CHICCHAN, the catalyst that “lights the fuse” of all our Spiritual Gifts. 9 CHICCHAN is also a Portal Day. Also in our future, our Ascension on Tone 13 is Offering/MULUC, the Day Sign of Atonement through an Offering, a personal Sacrifice. Mother Earth CABAN is turning us toward a new realization of our place in the Universe from the Higher Perspective of our Oneness with Every Thing. On 13 MULUC we will manifest a Miracle, made possible through a Divine Communion, Paying Back and Paying Forward the Love of Mother Earth. The Earth is a manifestation of the Creator’s Love. The Wind/IK glyph illustrates the t-shaped portals the Maya carved in stone. 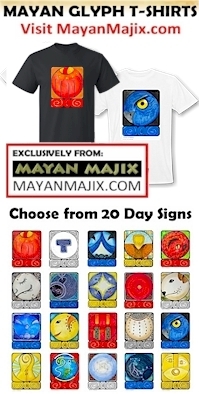 The Mayan daykeeper, artist, and historian Hunbatz Men explains this as a symbol of the Sacred Tree of the world, the axis mundi upon which the shaman’s spirit may climb. It also functions as a portal leading to the Great Spirit, through which the breath of life may pass. “A transcendental synthesis of human religious experience is inherent in the word te, Sacred Tree, which emerged from the words teol and teotl the names of God the Creator in Mayan and Nahuatl. These most revered and sacred words of the ancient people, symbolized by the Sacred Tree, were represented in the Mayan hieroglyphs as the symbol ‘T.’ Additionally, this symbol represented the air, the wind, the divine breath of God.” [Source] FYI – How does “te” feel when you say it? The Highest State of Human Consciousness predicted by the Tun is a Transformation to the Truth of Ethics, a state of Living in Integrity with the Intentions of the Creator. Interestingly, the Consciousness that precedes it is a Transformation of Power, a realization of personal Power. Through the darkness of Power and the full understanding of the effects of Power when it is not used for the Harmony of the Whole, creates the Meaning and Purpose for Ethics. The darkness makes this new Revelation of Light possible for Humanity to See and Realize. Through Ethics and the Intention to Offer our own Will to the Divine Will of the Creator, Humanity would fulfill the Creator’s Dream of Divine Justice of the Harmony and Equity of the Whole. The 9th uinal intends for us to Know the Reason for the Whole Creation. We exist in a magnified and multiplied accelerated cycle of Transformation. Tone 6 establishes a rhythm and flow of movement. We gain the momentum to complete another climb of Spiritual Growth. We’ve been focused on the elements of Creation… holding a Dream, stabilizing a direction, and generating the power to move forward. The Peak Energy of 6 brings it all together to accelerate our progress. Wind/IK, the Whirlwind, reminds us that we are not going in circles but ever spiraling to a Higher Perspective. One of the major blessings I’ve found in the calendar (and Consciousness) is the gift of going back in time to old teachings and sacred ceremonies. All that was veiled in mystery is seen in a new way. The Truth didn’t change, yet I see it in an entirely new way. Unveiling the secret became possible the more I realized the power of our imagination. It’s now okay that I didn’t “get it” all back then, because it’s still there for me to “get” today. The Elders of Wisdom/CIB define the whole of our experience as an archeological treasure, always offering a new discovery. Wind/IK is the Day Sign of the Breath of Life and Breath of Spirit. We were breathed to Life by the Creator as the Inhabitants of Authority on Mother Earth. Human was created to be the Light of the Earth. Our Divine Meaning and Purpose was also breathed into the Seed of our Spiritual Being. Our Journey on Earth is a perpetual climb from our perception of the world below, to the Divine Perspective from Above. The Cherokee Whirlwind illustrates the double-helix of smoke that carries our prayers to the Creator. The Whirlwind was the 13th Dancer that led from the Above the 12 Dancers in the Below. The Whirlwind resides in the North, the Place of the Ascended Masters, the Whole of our Collective Wisdom. As the Element of Air, it relates to the faculties of the mind and our own ability through Consciousness to participate in a Divine Creation. Human is Sacred to the Creator as the one that must bear the scars of physicality, while given the Divine Purpose of Completing the Creator’s Dream of Unconditional Love. Only through the Human Response to the Creator’s Breath could the Dream be Completed. Human’s Gift to the Whole is to Breath Back a creation of an Earthly Reality that would reflect the balance between the Above and the Below. We were created to imagine our Unconditional Love as the Personification of the Creator’s Light. As Human, Ego is our challenge. We make our entire experience of living about our Self. We are constantly thinking about our Self. As we rise to a Higher Consciousness, we learn Compassion and Understanding for each other. We learn the Power of sharing and experiencing our Unconditional Love with Humanity. The 9th Uinal calls us to something even Higher, our place in the Universe. Just as we need everything that Mother Earth offers to exist, so does Mother Earth and the Universe need what Human has to offer. Earth/CABAN reminds us of what every Mother needs and longs for, to know their lives held meaning and purpose. When its all said and done, all the mistakes and the things I wish I’d done differently, as a Mother I only hope that my children would Know My Love. I know it myself deeply in my heart as a Love that Overflows. If that was the only thing my children were left knowing about me, it would satisfy a Divine Meaning and Purpose for all the time we shared together. Under the Intention of Tone 6 we are engaged to go with the Flow of Love. All the steps of Love are leading us toward a Revelation of Love that is shared by Mother Earth. We thought that the Unconditional Love was something we were learning how to create. From a Higher Perspective, Unconditional Love could be created in us when we Receive and Know the Compassionate Love of Mother Earth. Our Spirit and Matter could be forged together in a Divine Exchange. Today we can experience our Oneness and Movement with the Divine Forces of Nature through our Sacred Breath. We can draw through our breath the Light of the Creator. In the stillness of the place between our breaths, we can call on the Love to be crystallized in our imagination. On the out-breath, we can share the Breath Love we received from Mother Earth with the Whole of the Universe. To all my relations, may we look beyond our own Dream to the Creator’s Dream. May we see how from the Highest Perspectives of the Universe, Human is the Unseen Beauty of Mother Earth. We are an infinitely small part of the Whole, yet Divine in our Purpose. We are the Heart and Soul of the experiences the Mother’s Heart Must Bear, when she Knows she was created to be a Garden of Peace and Harmony. Her heart is torn by children who are divided. Her happiness is only complete when we all Love One Another. May we see that our own Happiness is never the Highest Intention of our Consciousness, and that our Own Highest Creation is a shared manifestation by the Whole. May we see that Mother Earth, our Source of Everything, also holds the Power to Create Love. It’s Created through her Human children when they discover the Truth of Her Love. Tone 6 gives us the Momentum of Spirit to complete our Climb. May we call on Divine Intervention to transform our Faith into Believing in the Love of Mother Earth. May we open our Hearts to Receive what she Longs for us to Know. May we engage the Exchange of Love as our own Song to the Universe. I’m grateful for the perpetual Love of Mother Earth, shared through the Beauty of every detail. UXMAL, Pyramid of the Magician. This one is fascinating as the only pyramid in the world with an elliptical base, correspondent with the Earth’s orbit. When I first shared my Dream on the gofundme page it was little more than my way of breathing a Dream into the Universe. My two Highest Dreams have been to manifest my book and to make a personal pilgrimage to experience the Mayan pyramids. I never imagined the support and love I would receive. I also didn’t realize how much the love was needed to realize my dream. The Jaguar Journey began with the Intention and has led me through the unknown with only footprints to follow. Through the core days of creation, the vision lay in the Creative Void. The trip has manifested itself as a solo journey I had to get over my fear to even make. Others who dreamed for me, gave me the Will to carry on. It is truly presenting itself as a journey we are making together.